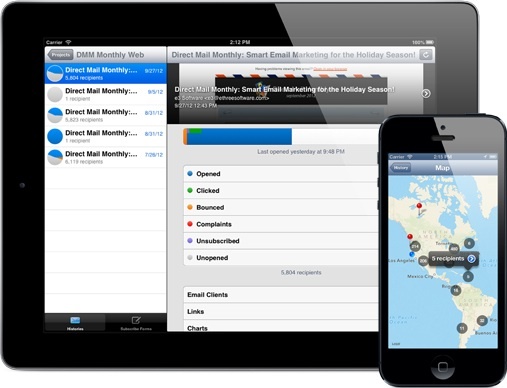 Stamps is a great way to view your email tracking reports from your iPhone, iPod touch, and now iPad! We’re happy to announce that version 1.2 of Stamps is available now from the App Store and features several great enhancements. We’ve enhanced the history reports to show you detailed activity information for each recipient. See which email addresses opened, clicked, bounced, unsubscribed, or filed a spam complaint. You can even see what each individual recipient clicked on in your message. Just like Direct Mail on your Mac, you can view a report of the top email clients and get a fully-interactive map of where your recipients were when they opened your email. 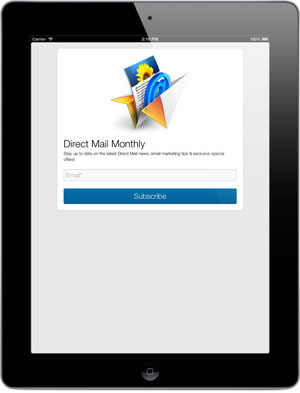 If you use your iPad in store or at trade shows to collect subscribers for your mailing list, then you will love the new full-screen mode for Stamps subscribe forms. Just use two fingers to zoom in to your subscribe form (just like you would to zoom into a page in Safari) and it will automatically go full-screen. If you already have Stamps on your device, open the App Store to update. If you haven’t tried out Stamps yet, visit https://directmailmac.com/stamps on your iPhone, iPod touch, or iPad to try it out. It’s completely free! You can learn more about it here.